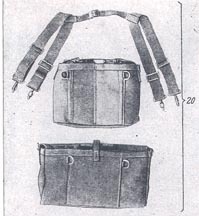 The Munitionstragevorrichtung 34 is a man-carried set of canvas pouches, each holding one ammo can and held in place under each arm by a sophisticated system of web-suspenders. 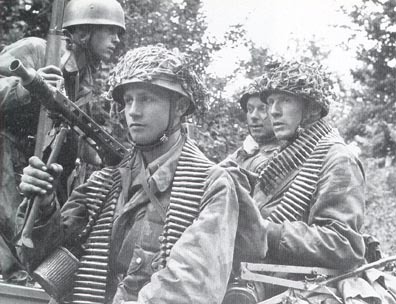 In the latter stages of the war the German soldier found himself to be carrying an increasing amount of equipment and ammunition, to maintain his mobility, his firepower and to make him more independend of the supply on a regular basis. He could no longer depend on mororized transportation, nor could he expect to be supplied by air. A dark blue - black canvas set with grey-blue web suspension and heavy duty carbine hooks. 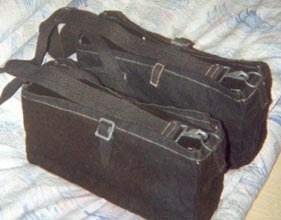 A short connecting strap sewn on both pouches maintain the position of the pouches. The set has been a natural part of the machingun crew, and contains the total of 600 rounds in belts, devided into the two ammo cans. An extremely scarce item and mostly single carrying pouches have been observed, as most of these outfits were cut into two single pouches. The set is ink-marked in a dark blue color which makes is difficult to verify: fuq 1942 and a boxed WaffenAmt. 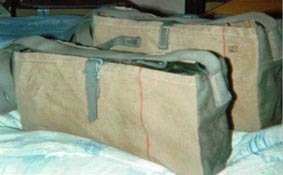 This ultra-scarce set is in tan canvas material. Manufactured in the very same canvas material as the MP/StG 44 magazine pouches, recognized by the color tone, quality and unmistakable red clue wowen into the fabric. The dull grey web-suspenders vary in color tone, the heavy duty carbine hooks are of diffrent types and the straps have no metal tip reinforcements. The set is marked 'ros 1945' and is probably among the last items coming out of this production line.